Since 2000 all carbon and nitrogen analyses were measured on a Thermoquest FlashEA 1112 elemental analyzer. To quantify total organic carbon and nitrogen (TOC, TON), triplicate 250 ml aliquots of seawater were first prefiltered through a 200 µm mesh, then filtered onto 25 mm ashed glass fibre filters (GF/F). These filters were dried at 60 °C before analysis. To quantify particulate organic carbon and nitrogen (POC, PON), triplicate 250 ml aliquots of seawater were first prefiltered through a 200 µm mesh, then filtered onto 25 mm ashed glass fibre filters (GF/F), these filters were then dried at 60 °C and acidified with sulphurous acid prior to analysis. Chlorophyll concentration is determined by filtering 100ml of seawater through 25mm GF/F filters in triplicate and extracted in 90% acetone overnight at 4°C. They are analysed on a Turner fluorometer according to Welshmeyer (1994). These data are generated to complement the HPLC pigments data as shown in the plots below. For the period between 1999 and the present HPLC chlorophylls have been used. For the earlier period (1992 - 1999), chlorophylls determined using fluorometric techniques were utilised. 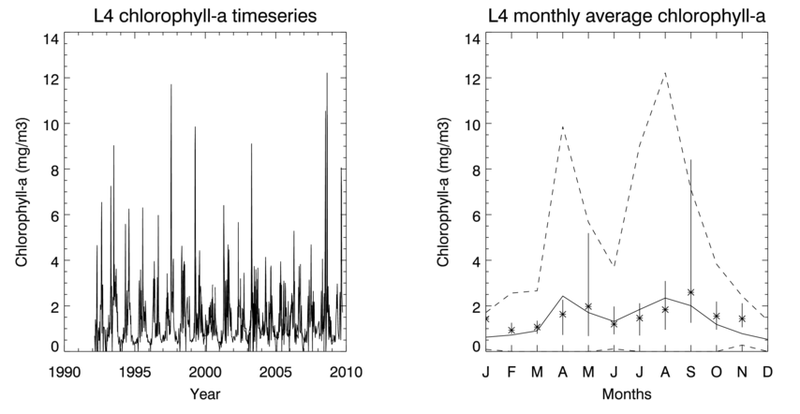 The left hand plot shows the considerable annual and interannual variability in retrievals of chlorophyll at L4. On the right the monthly averages have been calculated (solid line) and the maximum and minimum departure from this. The asterisks represent the satellite retrievals of chlorophyll at L4 with the error bars representing the maximum and minimum values.